With the lockout shortened season and offseason, it has been a crazy, shortened lead-up to the first games on Christmas day. These past few weeks have been led by Dwight Howard and Chris Paul wanting trades out of their current location. This has caused uproar against NBA stars “asking out” of their current situations, and not just from fans of the Magic or Hornets, but by NBA fans all over—including some still bitter Cleveland fans. This fan reaction is based on the idea that they have supported said players, and those guys shouldn’t just turn their back on the team and city. But if we look at it from the players’ viewpoint, it is a little different. I am a fan, I love sports, and in particular basketball. I have a favorite team that we cheer for, and of course I’d be upset if the team I cheered for lost its best player. But fans shouldn’t look at it as the player stabbing us in the back. It’s a business decision for the athlete. I think fans believe in loyalty in sports, but it isn’t necessarily true because it’s different for fans and players. Fans have, for the most part, loved the same team their entire lives (And if a fan has switched teams there is a good chance they aren’t truly fans, and have no right to be upset about “their favorite team” losing a player.). Because of this lifetime connection, fans are more attached to a team than the players are. And for the players it’s a business when it comes down to it: it’s their job. Their employer is the Los Angeles Lakers or the Memphis Grizzlies or whomever. They probably didn’t grow up watching and loving that team the way a fan has. They’ve been playing for a certain team for six years, not quite the amount of time you need to develop a connection and love for something (unless it’s a love for Chipotle, then that only takes one glorious trip and a few seconds of a delicious burrito). It’s their job, and Vince Carter aside, they mostly try their best night in and night out. And that’s really all a fan can ask for—while a player is on the team, he does the best he can. And if he stays his entire career, or just finishes his rookie contract, that’s life. 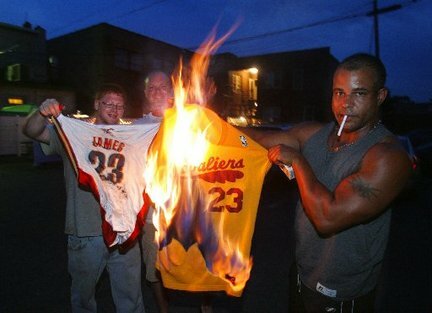 Cavs fans were not happy with "The Decision"
There were so many negative things said about LeBron James when he left Cleveland, but what would fans have done in that situation. Money isn’t a problem to James, with what he’s made on the court and his endorsement deals off it, he doesn’t need the cash. So it was really an opportunity for LeBron: an opportunity to go play with his buddies, in Miami, and still make a lot of money. And his buddies just happen to be some of the best players in the league. If I had the chance to work with two of my best friends, in a beautiful location and make a lot of money, I would do it in a second (Hell, I’ve had this conversation with a couple of my friends already, and think it would be a dream situation to work with people you have such a good time with.). And most fans probably would as well. We wouldn’t make our decision on a nationally televised special, because that is just stupid and “ego-tastic,” but we’d probably go work, and more importantly have fun, with our friends. And I don’t want Dwight or LeBron giving me career advice, unless it’s in the form of a check with a lot of zeroes. So now that Paul and Howard are asking for trades, fans shouldn’t be getting upset again. It’s life…it’s their business. This is what happens in business. If people see something better going on in another company, even at a competitor, they make the move. You don’t want to be stuck in a bad job, with coworkers who aren’t able to help you reach your potential, right? When we make business decisions, we probably don’t think about how it will affect every last customer. Why do we hold athletes to higher standards? Dwight could have gone about this in a better fashion. If you want out, that’s fine, but either say you want out, or live with the situation. 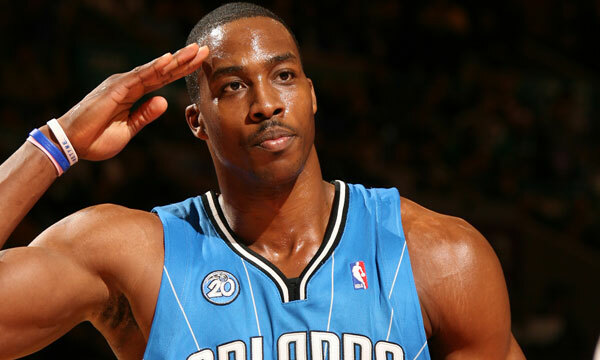 Dwight Howard asked for a trade then later said he wanted to stay in Orlando and he loved it there, or some line of crap he threw into the faces of the fans. Look, Dwight, and any other NBA player, has a right to ask for a trade and get out of his current location. Although from where I am right now, Orlando looks like a pretty sweet place to live. But if he wants to go that’s fine; just don’t go back and forth. It’s bigger than him, he’s messing with the fans and that isn’t right. If you ask for a trade and the Magic don’t accept an offer, then you’ll have to play there for a year. But don’t try to make it easier for yourself by saying you love it there. If you loved it so much, you wouldn’t have requested a trade in the first place. In a perfect world, he would quietly ask the GM for a trade, and go about his business as usual. And if a trade didn’t happen, then he would play the year out. Howard and Paul (who has already been traded) are both set to be free agents after this year anyway. After the 2011-2012 season, they are free to go wherever they want. And I mean wherever they want. Whether that is Orlando, New York, Los Angeles, Turkey or China…he earned the right to make his decision. 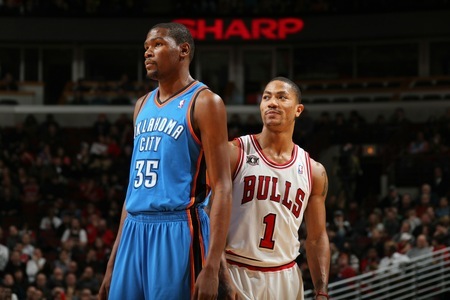 And with this idea in mind, doesn’t this make the guys like Derrick Rose and Kevin Durant that much more special? They want to win where they are. They did luck out with their teams though, don’t get me wrong. Both guys are in better situations than LeBron and Chris Paul were in, but I don’t think it would matter to them either way. They are happy to be in the city they are in, with the teammates they have. As a Bulls fan, I’d hate to see Rose go somewhere else. It would kill me if he was doing reverse layups or tomahawk dunks in colors other than red and white, but that’s the game. I’d still love him, I’d still cheer for him…I’d be lying if I said it would be the same, but I know that’s part of sports. That’s why I feel bad for fans when their favorite player leaves, or their team’s best player wants a trade. But that’s how professional sports are. And if we flip this around, the owners would do the same thing if they had a chance. LeBron wasn’t worth any more to Dan Gilbert than what he could get out of him. There is no loyalty for sport’s owners; it’s what have you done for me lately and what can you do in the future. 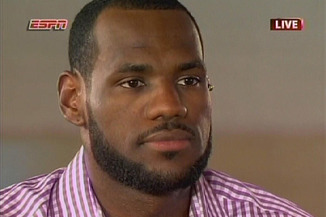 If LeBron wasn’t selling out Cleveland home and away games, Gilbert wouldn’t have cared if he went to Miami. But since he was the face of the franchise he should have less say in his situation? That seems backwards to me…he should have more say, because he earned it more. Those Cleveland teams were not good—er they were actually really bad. Yet, LeBron brought them to Eastern Conference Semifinals three times, the Eastern Conference Finals once and the NBA Finals once as well. Without LeBron, that team would have won around 20 games, much like they did last season, when they won 19 in their first post-LeBron season. Cavs fans should be able to love LeBron for what he gave them those seven years in Cleveland, not what he did on that hour television special. LeBron had the right to choose wherever he wanted to go…he shouldn’t have made his Decision the way he did, but that doesn’t mean he didn’t have the right to choose. And in the end, it comes down to the player’s choice. Because as fans, we may put a lot into the game, but our opinions don’t matter much, only our wallets do. This entry was posted on December 22, 2011 at 5:28 pm and is filed under Basketball, NBA, Sports. You can follow any responses to this entry through the RSS 2.0 feed. You can leave a response, or trackback from your own site.